This photographic composite features members of the 1911 Austin Senators baseball team, winners of the Texas League pennant. The composite itself carries a date of 1912. 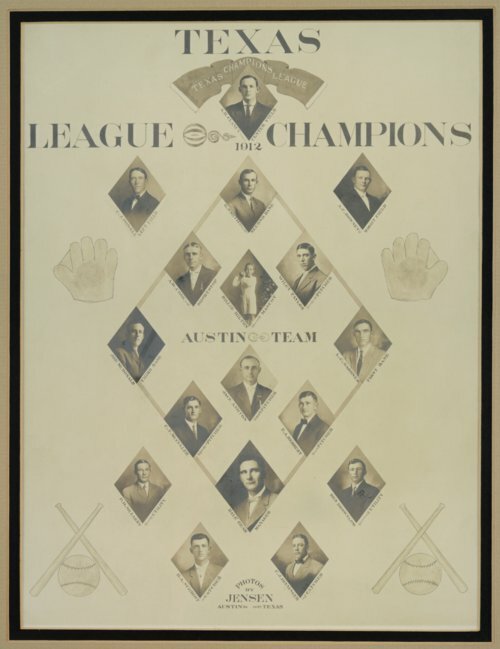 However, the team won the pennant in 1911, not 1912, and several of the individuals pictured were on the championship team but not the 1912 team. Two Kansans are among the players shown in the composite. Dale Gear was a player and manager for the 1911 Austin Senators. A native of Lone Elm, Kansas, Gear was a pitcher and outfielder for several minor league teams and two major league teams--the Cleveland Spiders and the Washington Senators. He also managed several minor league teams, including franchises in Topeka and Kansas City, Missouri. Gear was a long-time resident of Topeka, where he was prominent in both baseball and business circles. He served as the president of three minor leagues; later in life he was a member of the Shawnee County Commission. Dale Gear died in 1951 at the age of 79. Also pictured is Wiley Taylor, a right-handed pitcher from Louisville, Kansas. He was one of the Austin Senators' two best pitchers in 1911, earning a 22-14 record. In his three seasons with the Austin club (1911-13), his cumulative record was 51-47. Taylor pitched in 27 major league games between 1911 and 1914, including three games each with the Detroit Tigers and Chicago White Sox, and the remainder with the St. Louis Browns. His major league record was 2-10, with an ERA of 4.10. In the minor leagues, Wiley Taylor played not only for Austin, but also for teams in Ellsworth (KS), Louisville (KY), Lincoln (NE), Jersey City, Nashville, Salina, and Topeka. After his baseball career, Taylor remained in Pottawatomie County, where he farmed and served four terms as the county sheriff (1925-28 and 1945-48). Late in life, he also ran a service station and recreation parlor in Westmoreland. Wiley Taylor died in 1954 at the age of 65.